How much do we know about Japan? And how much do we know about Japan in the eyes of a European? 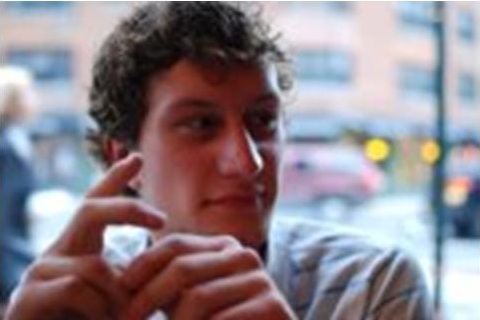 The Euroculturer invited Mathieu Munsch (Euroculture 2012/14) from France to share his experience in Japan. 1) Hello, Mathieu. Could you briefly introduce yourself and tell us why, when and for how long you were in Japan? Hi there! So, my name is Mathieu and I’m from Strasbourg. I started MA Euroculture at Rijksuniversiteit Groningen, and I am currently at Uppsala Universitet for my second semester. I went to Japan for a year through the Rotary Youth Exchange programme right after finishing high school at the age of 18. The idea behind this programme is to promote intercultural understanding by giving the opportunity to young people to experience the daily life and educational system of a different country. I therefore spent an extra year in high school among regular Japanese students and lived with five different host families, discovering each time a different facet of the Japanese way of life. 2) What were your expectations of Japan before you went there, and by what means were they formed (i.e. school education, media, friends who had been there, Japanese literature, movies, books, sushi, etc.)? I don’t remember having a clearly defined image of Japan before going there. I did Judo and Aikido in my youth, played video games and watched some Japanese animated films and series, all of which showed me a different aspect of Japanese culture. Japan was to me both the mythical land of the samurais where traditions are kept alive and codes of honour are very important, and the crazy techno-utopia with its megacities and state-of-the-art robotics. Also, I didn’t like fish and was worried that I wouldn’t be able to eat anything there. 3) During your stay in Japan did your expectations serve you well? Or did you experience something quite different than you expected? At first, I was amazed at how the two kinds of Japan that I had imagined were perfectly in harmony with each other; at how the traditional coexisted with – and was sometimes even enhanced by – the modern. Of course Japan is a very urban place where it is possible to travel from one city to another without actually getting out of the city, but I was glad to find that in the midst of all this hustle and bustle, it was not hard to find a quiet oasis to relax and enjoy all the wonders the land had to offer. Besides, to the delight of my taste buds, I discovered that the Japanese culinary landscape was far richer than the customary sushi (which, by the way, I also learned to love!). 4) What do you think are the dominant characteristics of Japanese people? And was it easy for you to get used to them? Provided that cultures only exist by comparison, it would be wrong to try to isolate some of the inherent Japanese characteristics. However, in comparison to people in France, I would say that the Japanese are more likely to set aside their individual interests to preserve the cohesion of a group. They have more respect for authority figures (such as teachers) and their elders (being only one year older than someone will, for instance, earn you a special honorific title). I also found the Japanese to be quite risk averse: they are obsessed with the weather, take preventive medicine and use percentages in their daily speech to assess the likeliness of an event. Uncertainty is not something that they feel comfortable with, and a great deal of what they do is preceded by careful planning. As for getting used to those differences, I think that as long as you arrive in the country with an open mind and without being persuaded that your way of doing things is the only right way, it cannot be too hard. I would even say that I learned quite a few lessons from their way of doing things. Awaji Island, during a school trip. 5) Do you think that Japanese people are familiar with European culture and Europe in general, and your home country in particular? And by what means, do you think, their expectations toward Europe are formed? Do they have the right image of Europe? My general impression was that the Japanese were quite curious about Europe. Some of them certainly knew more than others, but they were always very enthusiastic to hear what I had to say about my country. However, I am not sure if they perceive Europe itself as having ‘a culture’. In the minds of the majority, Europe is more about the distinctive cultures of the countries that compose it. I would say that the way their expectations towards Europe are formed is no different than the way we form ours: through film, music, pictures, food, etc. Also, I think that English classes (which are more American-oriented) play a major role in how Japanese people construct their image of the ‘West’. 6) Did you feel more European when you were in Japan compared to when you were in Europe? In Japan, I was above all a gaijin – a non-Japanese. It is quite an odd feeling when you catch yourself exchanging a nod of recognition with a random Indian that stands out of the crowd, simply because you know you are both sharing the same experience of being out-of-place. On a second level, I was a Westerner before being a European. To the Japanese eye, I simply appeared ‘white’ and it was therefore assumed that I spoke English – the language of the ‘West’. American, Brazilian, Australian, European… who can tell the difference anyway?! Perhaps Europe only exists if looked from within the ‘Western’ sphere. I have the impression that I didn’t feel ‘European’ until later, when I studied in the US. Japan gives you a much broader perspective: that of simply being a citizen of the world. 7) What was the most difficult part in living in Japan? No matter how great and rich in experience my year in Japan was, I didn’t always have it easy. I remember experiencing a few weeks of melancholy after the first two months, once the honeymoon phase (when everything is all novel and exciting) had passed and I realised that it was not going to be as easy to integrate as I had thought. The routine of school was hard to bear once my classmates had become accustomed to me being around and had stopped taking interest in me. I had long moments of solitude and spent a lot of time by myself, or around people who didn’t talk to me. But all of this was just temporary and, as the year went by, I had more and more fun everyday… all until the last day, when the goodbyes were heart-breaking. They tell you that going on exchange is going to be difficult, but let me tell you: coming back home has always been far more difficult than anything I have ever experienced while abroad. 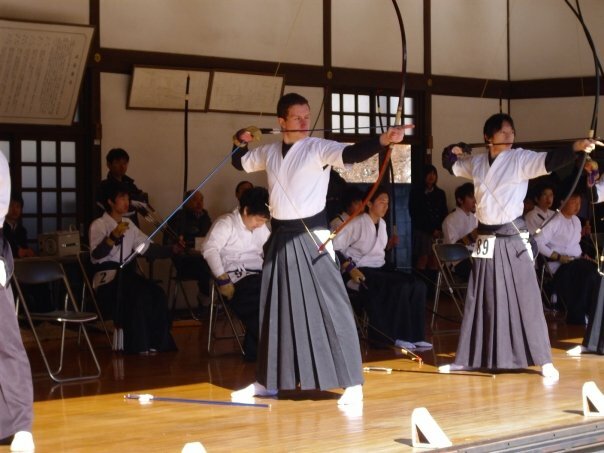 Kyūdō – the way of the bow – a Japanese martial art. At a school tournament. 8) Did you make any good Japanese friends that you could really talk to? I originally hung out with the ‘cool kids’ at school – those who weren’t afraid of going to a stranger to ask him all kinds of stupid things that guys all over the world can think of. But as I gradually became a wallflower for them, I started turning to the underdogs, the geeks, the silent guys sitting at the back of the class – those who were interested in a lot of things, not just the things that would make them popular in a high school setting. I also made a few good mates in my Kyudo dojo, where I spent most of my evenings after class. However, the real good friends that I made were not the ones from school, but those that I met through my exchange programme: people who had been abroad, could speak English and could understand what I was going through. My best memories are with them. 9) What do you think (judging from your experience in both European and Japanese settings) would be the most difficult part for your Japanese friends if they lived in Europe, if anything at all? I don’t think it would be particularly difficult for them to adapt to Europe, as our lifestyles and quality of life are relatively similar. Perhaps the most difficult part would be during the first few months, before they learn the language of their host country, but that is the same for everyone, Japanese or not. In general, all of my Japanese friends that have been to Europe have integrated pretty well and have had a positive experience. 10) What’s your best experience with Japanese culture? Japan is known for its bath culture, of which onsens are the icing on the cake. An onsen is a naturally occurring hot spring to which people come to relax and cleanse their soul. You haven’t seen beauty until you immerse yourself in a volcanic spring at the foot of a mountain as snow gently begins to fall on your head. 11) Lastly, what’s the most useless thing you bought in Japan? Thank you so much for your answers! We wish you all the best with everything you do!